Birthday Celebrations, Competitions And New Ventures! 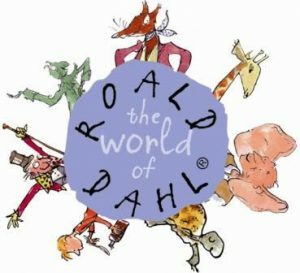 Which is your favourite Roald Dahl character? 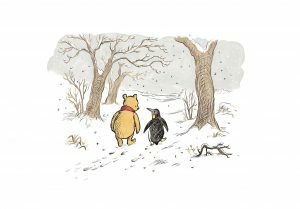 Meet ‘Winnie-The-Pooh’s’ new friend ‘Penguin’! 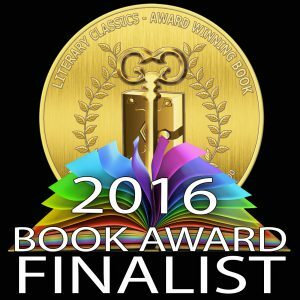 ‘Posie Pixie And The Fireworks Party’ looking super smart with its Children’s Literary Classics award-winning book medal on! Well, that’s quite enough from me for now. I shall bid you farewell and wish you a wonderfully whimsical weekend! If you have a passion for writing, whether you are young or old, then I would recommend that you write about what you know and you write about what you like. This is because your knowledge, interest and love of this subject matter will show in your writing. Immerse yourself within the topic you have chosen to write about. Spend time in that environment and understand the audience you are writing for. I am fortunate to be invited into schools for author visits and to judge children’s writing competitions. 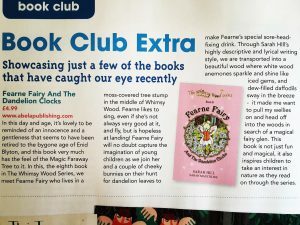 Not only do I thoroughly enjoy these ‘extra-curricular’ activities that I’m asked to do, but I’m able to engage with the audience that I write my Whimsy Wood children’s series for and this is vital. 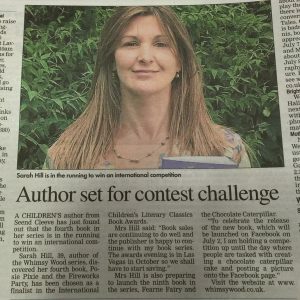 Sarah judging a children’s writing competition at The Little Hen House in Devizes, Wiltshire in March 2016. The next thing I would say is that you must sit down and write. I know this sounds simple in theory, but there can be so many distractions and other things that you can find to do, rather than actually start writing. Facing a blank page in your notebook, or blank screen on your laptop can be very off-putting, daunting and even a little scary! So much so that during creative writing workshops that I run for children aged 8-12 years old, the first thing that I’ll ask them to do, is to pick up their pen or pencil and scribble all over the blank piece of paper that is sat staring up at them from their desk. Once they’ve ‘beaten the blank piece of paper’ so to speak, and got their pen or pencil in contact with the paper, we then turn the paper over and start our creative writing workshop properly! 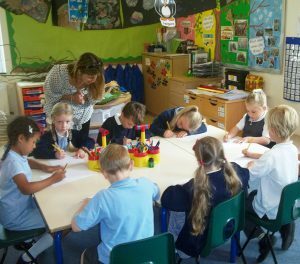 Sarah at Knebworth Primary School, Hertfordshire, helping the children ‘beat the blank piece of paper’! Don’t hold back, or let yourself get hung-up on grammar or sentence structure initially. What’s important when you first start writing, is to get the storyline that is whirling itself around in your head, down on paper. Once you’ve got that down, then go back and correct your grammar, spelling and sentence structure. Be prepared to rewrite your work numerous times, until you are completely and utterly satisfied with what you have written. Ok, so you now have your brilliantly written manuscript in front of you. Are you going to go down the route of self-publishing, or that of being traditionally published? I chose the route of traditional publication, so I can pass on any tips, pointers or advice that I have gained, following my own road to publication. First things first, you must believe 110% in what you have written and created. If you don’t believe whole-heartedly in your story, novel or series, no-one else will. Always remember that the world of literature, especially children’s literature is incredibly competitive. You will come across rejection, but do not be put off by this and do not give up. If you receive a rejection letter, pick yourself up, rework your manuscript and resubmit it to another publishing house or literary agent. Please accept and understand that this is the ‘nature of the beast’. Take on any constructive criticism, if you’re fortunate enough to receive this, following submitting your manuscript and realise that every successfully published author has gone through a similar journey. Finally, ensure you create yourself a support network of fellow writers on your road to and after publication. Join local writing groups and get yourself a writing coach. I subscribed to Suzanne Lieurance’s ‘The Morning Nudge’ a few years ago and receiving these free, daily emails really helped maintain my focus. If you are writing for children, then I would highly recommend that you join the Society of Children’s Writers and Illustrators (SCBWI). You do not have to be a published author to be able to join this wonderfully supportive international group. Writing can, at times, be a little lonely and insular, so having these groups and regular interaction with like-minded people, really does help further your writing career. 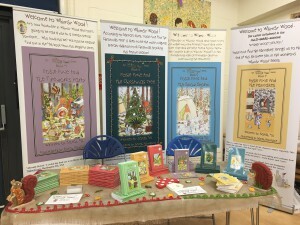 I am fortunate enough to have visited numerous primary schools and nurseries across England since my 1st ‘Whimsy Wood’ children’s book, ‘Posie Pixie And The Copper Kettle’, was published back in July 2013. I have also visited schools overseas via the amazing technology that is Skype! Sarah visiting Townsend Barn Nursery, Poulshot, Wiltshire. My woodland-based books for 5-8 year olds seem to lend themselves well to a classroom situation and I know of a number of schools that have spent the week following my visit, using the Whimsy Wood books in numeracy, literacy and geography lessons, to name but a few. 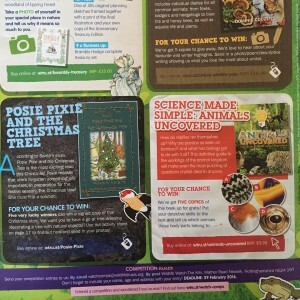 I naturally tend to use descriptive language, so an activity that can be done with children aged between 5 and 8 years old, would be to ask them to create their own woodland character and then to use 3 adjectives (sometimes called ‘wow words’ in various schools in the UK) to describe their creature. This activity has worked very well in a classroom during school visits. Usually, I have read part or all of the current Whimsy Wood book to the children before this activity. We’ve then discussed the sort of animals that you would find in a wood (not on a farm, not in a jungle, but a wood!) For the younger children, I have a very special ‘coming to visit a school’ bag, which contains a number of furry woodland toy animals. With this bag, I play a guessing game with the children, where I describe the woodland animal that’s about to come out of the bag and they have to guess which one it is! 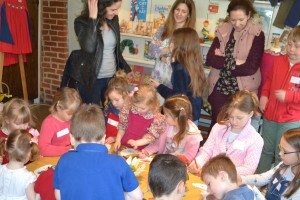 The result is of course the same, with the children’s imaginations warmed up with thinking about woodland creatures. 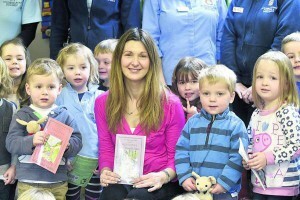 Sarah reading ‘Fearne Fairy And The Dandelion Clocks’ at Hope Nature Centre, Southwick, Wiltshire. I then tend to show the children a few images on my iPad of illustrations containing characters from my Whimsy Wood books and I ask the children how they would describe these characters. The aim is of course to warm up their use of descriptive language. Once we’ve done this, paper and pencils are distributed and the children draw their own woodland character. Sometimes children would rather create something outside of the confines of the task in hand, which is absolutely fine. I tend to be as flexible as possible with the children I’m visiting, as my real aim is to ignite their imaginations. If they want to draw a knight or a fairy for example then that’s great, because these 2 individuals may be visiting the wood! Likewise, characters from ‘Minecraft’ may have appeared in Whimsy Wood via a secret portal! Sarah at Knebworth Primary School, Hertfordshire, helping their Year 1 children create woodland characters! Another activity, related to my Whimsy Wood series, is woodland map creating. This is because at the back of every woodland book, there is a map of Whimsy Wood. This map is incomplete and more and more bits get added to the map as you read through the series. We leave the map incomplete so that children can fill in the map, using their imagination and what they have learnt from the story. Again, this activity may follow a reading of the current Whimsy Wood book. We then talk about the things that you’d see, hear, touch and smell within a wood. As with the previous activity, I am trying to stimulate the children’s imaginations. To help them, I will bring out my ‘magical mystical boxes’! Inside these multi-coloured boxes are various woodland flora and fauna. For example, in one box I have brightly coloured craft feathers (just because we’re discussing items that you’d find in a wood, they don’t all have to be brown and green!) In another I have small, plastic red and white spotty toadstools. I also happen to have a box containing miniature (fairy-sized I should say!) acorns! This is because I accidentally put a pair of my trousers in the washing machine, following a woodland walk with my family and our trusty dog Huxley. I’d squirrelled away these acorns in my pockets of the aforementioned trousers, forgotten about them, and shoved them into the washing machine…. Hey presto! I had accidentally carried out a science project of my own and shrunk these acorns into their now dainty form! These woodland items I like the children to pass around between them and again we talk about how these things look and feel. I then explain to the children the importance in using all your senses, whenever you are creating something. Whether it’s a painting, a story or, in this case, a woodland map. 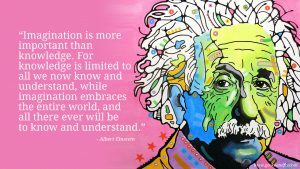 By using as many of your senses as possible, you will make your own creation that much more vivid and alive to the viewer or reader. Finally we talk about the need for a compass on your map and that this drawing is a ‘bird’s eye view’ of the wood. I’ll show them the map at the back of the Whimsy Wood book that we’ve read and I’ll explain that their own woodland map doesn’t have to be of Whimsy Wood. It can be for any wood that they fancy. Perhaps it’s one that they’ve visited with their family, or perhaps it’s an imaginary one with candy floss trees and popcorn hedgerows! What’s important is that they’ve used their imaginations to transport themselves and created something on paper (being their woodland map or their woodland creature above) from absolutely nothing! Now that is a marvellous achievement for anyone and something indeed to be proud of. 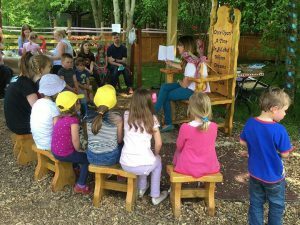 If you’d like to know more about the Whimsy Wood school visits, availability and booking methods, then please choose ‘School Visits’ from the horizontal menu at the top of this page. Many thanks and wishing you all a wonderfully whimsical weekend! 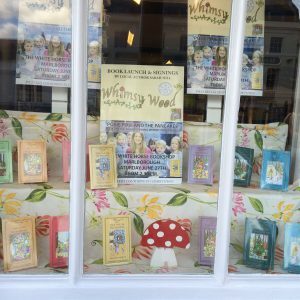 In the previous post, I explained how I ended up writing my ‘Whimsy Wood’ children’s stories and that there are 35 books within this woodland-based series for 5-8 year olds. These 35 are divided into 5 sets each containing 7 books. 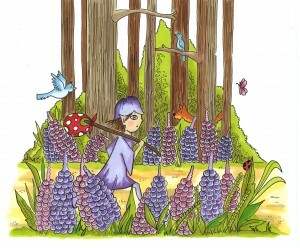 The first set of 7 books are all about ‘Posie Pixie’ and her adventures within the enchanting Whimsy Wood. The second set follows ‘Fearne Fairy’ and her escapades. As for the remaining 3 sets…..well, I couldn’t possibly tell you who the main characters are for these books! That will remain a secret until we reach their publication! 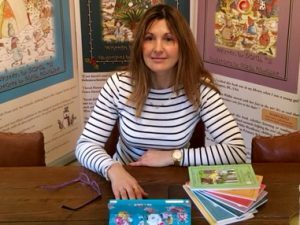 ‘Whimsy Wood’ children’s author Sarah Hill. Now, as a parent, I wanted my stories to be subtly educational and have real meaning to them, as well as being great bedtime reads. So, I decided that each book would be written for a specific month in the calendar. As you read through the Whimsy Wood Series, you’ll see that the flora and fauna change, both in the text and the illustrations. There is also a proverb or well known saying, tucked away within every story for the reader to find. Finally, at the back of every Whimsy Wood book, there’s a Whimsy Wood map for the child to complete, using just their imagination and what they have learnt from the story. One of the aims of my whimsical series is to ignite children’s imaginations. Another aim is to engage children and their parents and carers more with nature and the beauty that surrounds us, wherever you live in the world. This is one of the reasons, along with my love of nature and wildlife, that Abela Publishing (who publish my Whimsy Wood Series) and I, decided that we would donate 10% of all Whimsy Wood book sales to The Wildlife Trusts. Since each Whimsy Wood book is written for a specific month in the calendar, this already gives me a structure to the story that I need to write. For example, if the book is going to be for the month of April (which incidentally, book 9, ‘Fearne Fairy And The Chocolate Caterpillar’ is) then I think of all the events that may happen at this time of year. 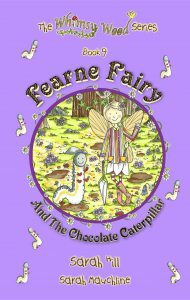 Easter immediately sprung to mind when I was planning ‘Fearne Fairy And The Chocolate Caterpillar’ and then my brain (and tummy) thought of chocolate of course! Hence why this features in the title and story! Once I’ve considered familiar events that may happen for the month that I’m writing for, I then research which flowers, toadstools, trees, animals, birds and insects would be out and about in a wood at that time of year. I then gather all this information together and create a mind map on a blank piece of A4 paper, with the title of the book in the middle of the mind map. Sometimes I don’t have the title until I’ve finished writing the story. When that happens, I just leave this central space of my mind map blank until the title comes to me. Beautiful quote which perfectly explains the joy of writing. 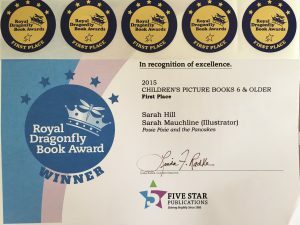 Although book 9, ‘Fearne Fairy And The Chocolate Caterpillar’, was launched on July the 2nd, I have already written up to book 14 in my now award-winning series. The reason that I am a little ahead of myself, is because I was expecting our 3rd child when Abela Publishing sent me my author’s contract back in January 2013. Monty, our baby boy, arrived on June the 26th 2013, which was barely 2 weeks before the publication of book 1, ‘Posie Pixie And The Copper Kettle’! 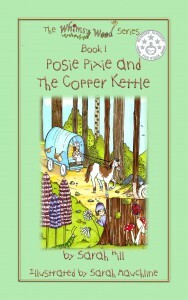 Front Cover Of ‘Posie Pixie And The Copper Kettle’, Book 1 In The Whimsy Wood Series. When I signed with Abela Publishing, they’d stated that they wanted to release 3 Whimsy Wood titles (evenly spaced out of course) a year. I already had 2 young daughters at that stage and with adding a baby into the mix, I knew I’d have my work cut out writing my series as well. So, whilst still pregnant with Monty, I got my writing skates on, penned up to book 14 and bought myself some breathing space in the process! As an author however, not all your time is dedicated to writing, as I soon discovered! Dreaming up a concept, turning it into an imagination-stimulating story and then convincing a publisher to take on your work, is just the beginning! There is a lot of self-promotion that is required, if you wish your literary dream to do well. This promotion ranges from using all forms of social media to get your book ‘out there’, to book signings, school visits, library events and other such personal appearances, along with writing your own blog or 2! Talking of which, I’d best stop waffling on and click ‘publish’ on this post! Once upon a time, I was working in practice as a small animal Veterinary Surgeon. I already had a baby daughter called Olivia and my husband Matt and I were fortunate enough to be expecting our second baby. Before long (around 9 months I believe!) Poppy, our second baby girl, entered our lives. My husband was having to travel overseas a lot on various business ventures back then and so we decided that I would take a back seat and stay at home, to raise our 2 very young girls. Well, it could only have been 6 months or so from taking a career break from Veterinary Medicine, when one of the main characters in my ‘Whimsy Wood’ children’s series for 5-8 years old, appeared in my head all by her little self! This particular character is called ‘Posie Pixie’ and she is terribly persistent! Extremely loveable, but very persistent nonetheless! With Posie chattering away to me about all her exciting adventures in the enchanting Whimsy Wood, I really had no other choice but to sit down and start writing her stories. I didn’t consciously think that I was going to start writing for children during this interlude in my Veterinary career. It just happened. I know that sounds rather strange but that really is the only way I can explain it. I didn’t have to think of a name for Posie, as in my peculiarly wired brain, she was already called that. This was similar for many of my Whimsy Wood characters. Here’s ‘Mrs Spottisedowne the sparrow’, ‘Posie Pixie’ and ‘Raspberry Rabbit’ as they appear in book 3, ‘Posie Pixie And The Torn Tunic’. Perhaps my subconscious had been busy for a while creating my 35-book children’s series, as I can see a number of influences in my woodland stories. These influences range from my favourite books when I was a child (Enid Bylton’s ‘Far Away Tree’ collection and Jill Barklem’s ‘Brambly Hedge’ series to name a few), to the places we spend a lot of time frequenting now as a family. There’s also my Veterinary background and my love for all animals, so I guess these fabulous furry creatures were always going to feature in my whimsical children’s books. When I finally sat down and penned Posie Pixie’s Whimsy Wood adventures to paper, I discovered how much I absolutely love writing and getting lost inside my own imagination. Before I knew it, 6 months had passed and I had 4 decent Whimsy Wood stories. 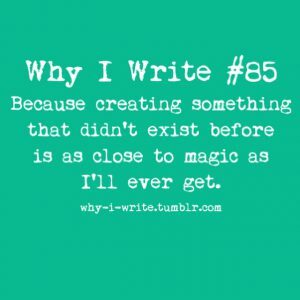 Since I had discovered a passion for writing and I had 110% belief in the Whimsy Wood Series that I had created, I didn’t want to give up on it. So I decided to ‘bite the bullet’ and start submitting my manuscripts to literary agents and publishing houses. This was the beginning of an almost 3 year roller coaster of rejection, followed by picking myself up, rewriting my stories and resubmitting them. To cut a very long and soul-searching story short, I was finally taken on by Abela Publishing, a small publishing house based in Sandhurst, England. My much desired author’s contract with Abela Publishing arrived in January 2013 and book 1, ‘Posie Pixie And The Copper Kettle’, was published in July that year. 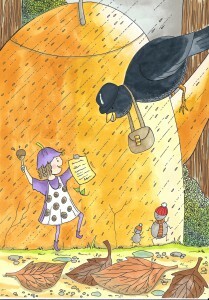 ‘Posie Pixie’ and ‘Mr Bilberry the blackbird’ with Sarah’s author contract! 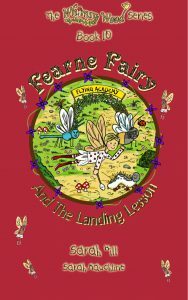 We are now 3 years on and book 9, ‘Fearne Fairy And The Chocolate Caterpillar’, was launched on July the 2nd 2016. You’ll notice that the main Whimsy Wood character has changed from ‘Posie Pixie’ to ‘Fearne Fairy’. This is because the 35 books in my Whimsy Wood Series are divided into 5 sets of 7 books. 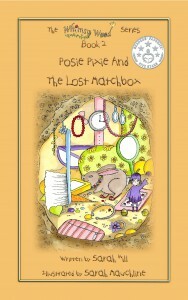 The first 7 stories are all about Posie and her adventures in Whimsy Wood. The second 7 are about Fearne. As for the rest of the books, well you’ll just have to wait and see! Fearne in the midst of her spring-cleaning in book 8, ‘Fearne Fairy And The Dandelion Clocks’. I’m currently moonwalking (badly!) across the floor and singing Elvis Presley’s well known song about America’s playground to myself, because I’ve confirmed that I’ll be attending the 6th annual Children’s Literary Classics Book Awards in Las Vegas! This incredibly exciting event runs for 3 days, starting on October the 13th and ending with the Vegas Valley Book Festival on October the 15th. 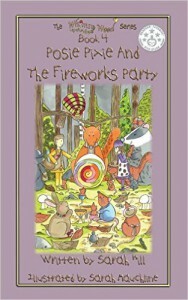 The reason I’ve been invited is because my 4th ‘Whimsy Wood’ children’s book, titled ‘Posie Pixie And The Fireworks Party’, won the Chapter Book category of this prestigious book awards. I discovered this fantastic news a few weeks ago and I must confess that it’s still sinking in! It’ll be the first time that I’ve attended a book awards ceremony of this magnitude and abroad before. My husband Matt is coming as well, in some vague attempt to try and keep me calm and help me behave like a grown-up! I already feel like an over-shaken bottle of pop, waiting to explode with excitement at any moment! Goodness only knows what I’ll be like when we get there! Most of this 3 day extravaganza will take place at The Golden Nugget Hotel in Las Vegas. This hotel has a water slide running through the hotel! If that’s not exciting enough, then this particular water slide also happens to pass through a shark tank on its way through the hotel! Whaaaat! http://www.goldennugget.com/lasvegas/pool_thetank.asp I promise to report back following this chance-of-a-lifetime trip, providing I haven’t been eaten by any of these sharks! 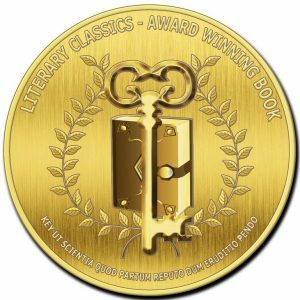 Literary Classics Winning Gold Medal! Wishing you a wonderfully whimsical weekend. Exactly 3 years ago, my 1st Whimsy Wood children’s book, titled ‘Posie Pixie And The Copper Kettle’, was published by Abela Publishing based in Sandhurst, England. I had travelled the standard road to traditional publication, with constant writing, editing, submitting my manuscripts to literary agents and publishing houses, getting rejected, picking myself up again, re-writing my Whimsy Wood stories and resubmitting them. For me, this process took around 3 years before I received my much treasured ‘author’s contract’ with Abela Publishing! The exceptionally exciting publication of my 1st ever children’s book and the 1st Whimsy Wood story, ‘Posie Pixie And The Copper Kettle’, happened barely 2 weeks after the birth of my 3rd child. A baby boy named Monty! What a year 2013 was for us! 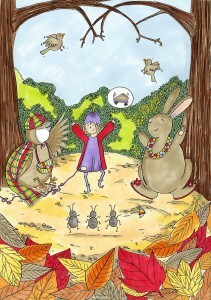 Three years on and there are now nine books published from my Whimsy Wood series for 5-8 year olds. 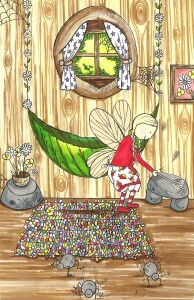 The latest one being ‘Fearne Fairy And The Chocolate Caterpillar’, which was published on July the 2nd this year. To celebrate the 3rd birthday of ‘Posie Pixie And The Copper Kettle’, here is an extract from this 1st exciting Whimsy Wood adventure! ‘…..Before she could think anymore, Posie was surprised by a strange clanging and banging sound getting louder and louder behind her. She turned around to see a beautiful sky-blue caravan being pulled through the wood by a large brown and white carthorse. A round, cheerful woman with rosy red cheeks and dark curly hair was sitting at the front of the caravan. She was holding onto the horse’s reins and singing a merry song as they rode along. I’m as happy as I can be! Wishing you a wonderfully whimsical week ahead! Last weekend I was very fortunate to find myself away with some of my closest and oldest friends. These friends in question are ladies I’ve known since we were at Bristol University, over 2 decades ago. Whilst having this break from the norm, enjoying their company, relaxing and unwinding (in a fabulous Surrey spa no less!) my mind happened to wander and it unintentionally created a completely new idea and plot for a children’s book! This new literary concept is completely unrelated to my ‘Whimsy Wood’ series and would be for older children aged 9+ , while my Whimsy Wood children’s books are for 5-8 year olds. 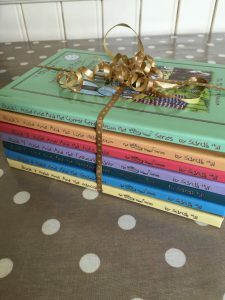 In all fairness, children younger than 5 and indeed older than 8 enjoy these whimsical woodland stories, but in this day and age, we are required to specify a recommended age range for children’s literature and so ‘early-readers’ or for 5-8 year olds, is the recommended age range for the Whimsy Wood stories. Anyway, this isn’t the 1st non-Whimsy Wood book for older children that my wee brain has conjured up. It is indeed the 2nd and the plots, characters and general story lines for both these books (which are also unrelated to each other) I’ve already noted down. If I don’t commit these ideas to paper when they come to me, then they have a tendency of vanishing like wisps of smoke, in rather the same non-tangible way that they originally appeared! Now whilst I was reading this quarter’s SCBWI (Society of Children’s Book Writers and Illustrators) magazine, I came across a rather wonderful poem by Jennifer Moore, who has managed to sum up this random appearance of potentially new literary characters that writers get. But they flee before the light. While you’re trying to get clean. And they whisper in their ears. And that’s their cue to go. My Whimsy Wood Series itself is approximately a 10 year project, as there are 35 books in this enchanting woodland series and Abela Publishing (who publish my series) wish to release 3 books from the series each year. 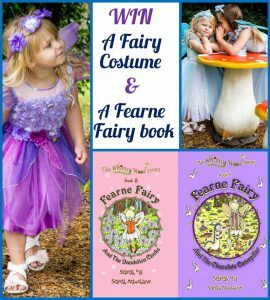 Considering book 1, ‘Posie Pixie And The Copper Kettle’, was 1st published in July 2013 and book 9, ‘Fearne Fairy And The Chocolate Caterpillar’, is due to be launched on July the 2nd, I have a fair way to go with the Whimsy Wood Series yet! However, there’s no harm in having these additional creative ideas (I may have had enough of ‘Whimsy Wood’ by the time I reach the end of the series!) and who knows if these 2 non-Whimsy Wood children’s books will ever reach publication, but they are certainly another goal and dream for me to try to achieve, once the Whimsy Wood Series is complete. 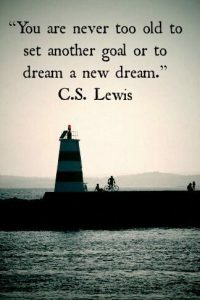 In the words of C.S.Lewis…. 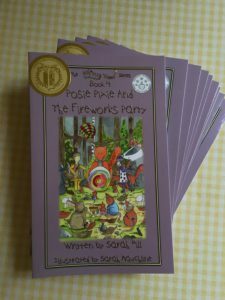 The Fan-Fizzle-Tastic Front Cover Of ‘Posie Pixie And The Fireworks Party’! In other ‘Whimsy Wood’ news and with the online launch of book 9, ‘Fearne Fairy And The Chocolate Caterpillar’ fast approaching (July the 2nd to be precise!) the Whimsy Wood team and I thought we’d run a competition to win signed copies of this latest chocolatey instalment, to celebrate this exciting event! 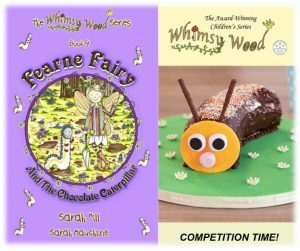 This competition will be run on the Whimsy Wood Facebook page:- https://www.facebook.com/WhimsyWoodSeries/ and all you have to do to enter, is make a chocolate caterpillar cake and post a photo of your amazing culinary efforts on to the Whimsy Wood Facebook page. 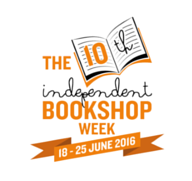 This competition will run from Saturday June the 25thm until book 9’s official launch date of July the 2nd. We will then notify the successful winners via the Whimsy Wood Facebook page!